Summer vagrant; bred 1992, 2002. Migration visitant. The White-eyed Vireo was very rare during the Minnesota Breeding Bird Atlas (MNBBA). The White-eyed Vireo is found primarily in the southeastern states from southern New England west to eastern Iowa and south to Texas and Florida. It is less common north of southern Missouri, the Ohio River, the Appalachian Mountains, and Virginia. Highest densities are found along the coastal plain from southeast Texas to Florida, especially in Arkansas, Alabama, Louisiana, and Mississippi (Figure 1). A short- to medium-distance migrant that winters along the southern Atlantic coast, the Gulf coast to Yucatan and Belize, and in Cuba and the Bahamas. An insectivore that feeds on caterpillars, moths, and butterflies that are gleaned from the foliage. A cup nest that is suspended in the fork of two twigs, well concealed, and low to the ground. Breeding distribution and relative abundance of the White-eyed Vireo in North America based on the federal Breeding Bird Survey, 2011–2015 (Sauer et al. 2017). The White-eyed Vireo is one of the smallest North American vireos and is very hard to see in the dense scrub that it inhabits. A glimpse of its distinctive white eye and yellow spectacles gives it away, but more often its elaborate jumbled song advertises its presence. There were no records of the White-eyed Vireo when Roberts wrote his treatise The Birds of Minnesota in 1932. The first observation was in Stearns County, July 31, 1941 (Hiemenz 1965). The species was not reported again until the 1960s, when there were 3 separate descriptions: June 5–6, 1983, Ramsey County (Holtz 1983); May 16, 1964, Minnesota Ornithologists’ Union files, Brown County; and May 23–24, 1965, Goodhue County (Huber 1965). In the 1970s, there were 2 more records: May 3, 1977, Washington County (Wojahn 1977), and May 25, 1977, Hennepin County (Fuller 1977). In the decades after these early observations, the number of records steadily increased to 13 in the 1980s, 13 in the 1990s, and 20 from 2000–2013. Almost all these records were vagrant migrants in the spring (68%) and the fall (10%); the rest were summer records. With a few exceptions, discussed below, the migrant records were scattered throughout the southern third of the state, from Anoka County west to Swift County and south to the Iowa border. The spring migration was from the end of April and throughout May, and many of the birds found were singing males; in the fall, the birds were very late migrants, late October to late November. In these southern counties, it is difficult to know if they were displaced migrants or singing territorial birds. The few birds found in the northern two-thirds of the state were spring records, 2 from Clay County (1989, 2001), 1 from Otter Tail County (2000), and 1 remarkable fall record from Lutsen, Cook County, October 25–28, 2001 (Stephenson 2002). There are a dozen records for the White-eyed Vireo during the summer season, starting in the 1980s (1983, 1986, and 1989). Except for a bird banded at Buffalo River State Park, Clay County (Nielsen 2005), all incidental summer records were south of the Twin Cities (Brown, Martin, Pipestone, Ramsey, Rice, Scott, and Winona Counties). Most birds were recorded on only a few days in early June, but several were seen longer: Martin County, June 6–July 1, 1986 (Sullivan 1986); Brown County, June 21–July 4, 1999 (Wiens 2000); Winona County, July 13–August 2002 (Eckert 2003). In addition, there are 2 breeding records that are well documented: Houston County (Schumacher 1992) and Steele County (Swanson and Batt 2002). During the MNBBA from 2009 to 2013, only 1 record was submitted. It was on June 15, 2010, from the Minnesota Department of Natural Resources’ Natural Heritage data base (T107R22a) (Figure 2). It was a possible breeding observation by Steve Stucker, both seen and heard, on June 15, 2010, near Goose Lake in Waseca County. Breeding distribution of the White-eyed Vireo in Minnesota based on the Breeding Bird Atlas (2009 – 2013). Summary statistics for the White-eyed Vireo observations by breeding status category for all blocks and priority blocks (each 5 km x 5 km) surveyed during the Minnesota Breeding Bird Atlas (2009-2013). The most common attribute of the White-eyed Vireo’s habitat is the denseness of the vegetation. This scrubby habitat can be found along forest edges, utility corridors, abandoned pastures, streamsides, and swamp thickets. The vegetation can be brambles, briers, willow shrubs, wild plum, and dense saplings in early-successional habitat (Hopp et al. 1995). Partners in Flight estimated a population of 20 million White-eyed Vireos (Rosenberg et al. 2016). 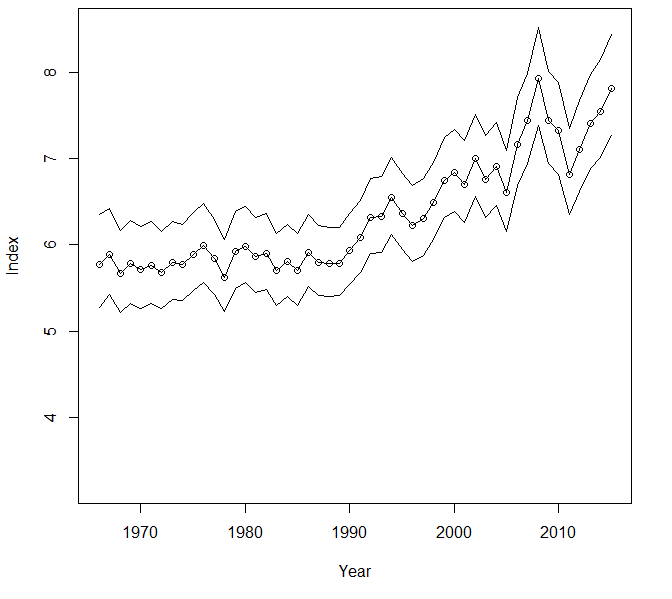 The federal Breeding Bird Survey shows a significantly increasing population of 0.62% per year from 1966 to 2015 in the United States (Figure 3). The only states where the White-eyed Vireo had a significant decline were Delaware, Maryland, and West Virginia (Sauer et al. 2017). Overall, however, Rosenberg et al. (2016) estimated that the species’ population in the United States had increased by 33% from 1970 to 2014. Breeding population trend for the White-eyed Vireo in the United States for 1966–2015 based on the federal Breeding Bird Survey (Sauer et al 2017). Partners in Flight assigned the White-eyed Vireo a relatively low Continental Concern Score of 8/20 (Rosenberg et al. 2016). White-eyed Vireos were reported as expanding in Wisconsin since the 1960s, but Wisconsin’s first breeding bird atlas from 1995 to 2000 failed to find a nest (Cutright et al. 2006). Previously, however, a pair carrying food was observed in Dane County in 1972 on several occasions, and a nest was found in 1988 in Waukesha County in Wisconsin (Robbins 1991). In Michigan, the White-eyed Vireo was reported to be increasing in the 1960s and 1970s, but only a modest increase was detected in the species between its first breeding bird atlas in 1983–1988 to its second atlas in 2002–2008 (Reinoehl 2011). The White-eyed Vireo has a substantial and increasing population and a relatively wide breeding range that should provide stability and little concern for its future. This will be an interesting species to watch over the coming years. Will it continue an expansion northward? How will it be affected by habitat availability or future changes in climate? Eckert, Kim R. 2003. “Proceedings of the Minnesota Ornithologists’ Union Records Committee.” Loon 75: 41–46. Fuller, Pepper. 1977. “White-eyed Vireo in Wayzata.” Loon 49: 174. Hiemenz, Nestor M. 1965. “Unusual Minnesota Records.” Loon 37: 52–53. Holtz, Robert E. 1983. “White-eyed Vireo in Roseville.” Loon 55:90–91. Huber, Ronald L. 1965. “The Spring Season.” Loon 37: 136–144. Nielsen, Gary E. 2005. “White-eyed Vireo Banded in Clay County.” Loon 77: 116. Schumacher, Carol. 1992. “Probable Minnesota White-eyed Vireo Nesting Record, Houston County, 1991.” Loon 64: 50–52. Stephenson, Jeff J. 2002. “Late White-eyed Vireo in Cook County.” Loon 74: 121–122. Sullivan, Paul. 1986. “White-eyed Vireo in Martin County.” Loon 58: 139. Swanson, Norma, and Al Batt. 2002. “White-eyed Vireo Nesting in Steele County.” Loon 74: 40–41. Wiens, Terry P. 2000. “The Summer Season (1 June to 31 July 1999).” Loon 72: 14–36. Wojahn, Barbara. 1977. “White-eyed Vireo Confirmed for Minnesota.” Loon 49: 174.